Everyone knows I have a talent for getting lost. It’s something I do with monotonous regularity and, usually, it doesn’t bother me. In fact I’ve found some pretty interesting things that way and I always know it’s only a matter of time before I find my way back to somewhere familiar. Ok, so there has been the odd time, in the middle of the woods, when my stomach has tightened momentarily and I’ve had visions of being found as a skeleton under a tree. GPS has often been my saviour but, on Sunday, it was a different story altogether. I was lost, frightened and in a state of panic. It all started off so well too. 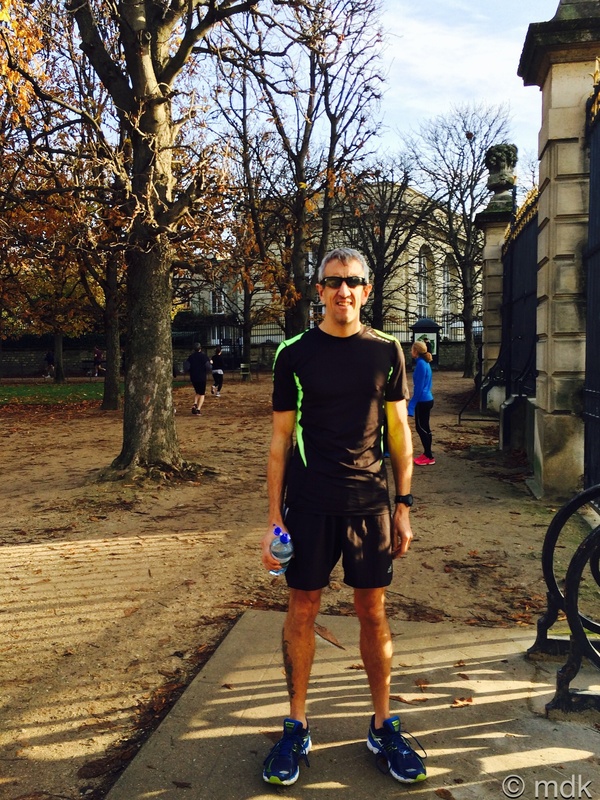 Commando wanted to go for a run in Jardin du Luxembourg and I was looking forward to having a walk round taking photos of some of the hundred or so statues and monuments, the chateau and the plants. After a bit of wandering around Gare du Nord looking for the right line we took the metro to the park. There seemed little point in wasting time walking the route we’d already seen the day before after all. The metro took us to the opposite side of the park to the one we’d entered on Sunday and this, ultimately, was my undoing. Behind the high railings the place was already full of runners as we walked through the gates. 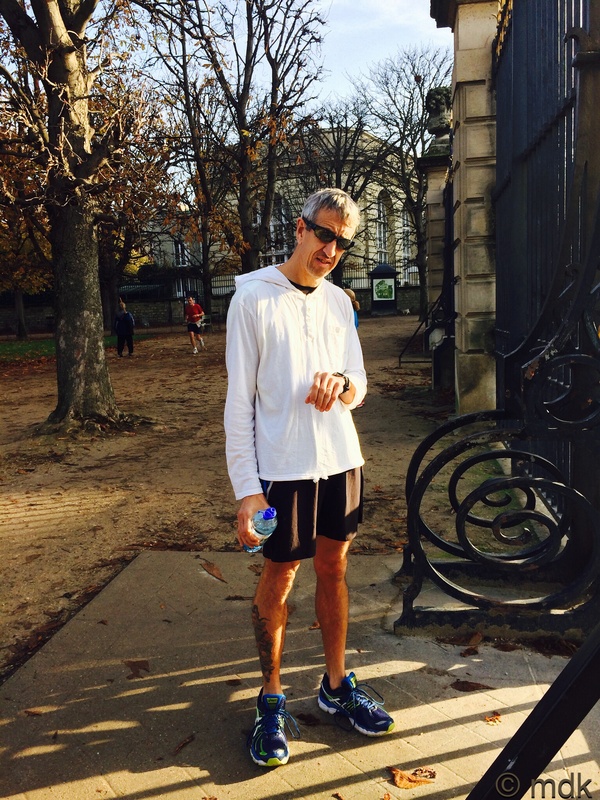 Commando stripped off his sweat top, switched on his Garmin to find the satellite signal and prepared for his run. My rucksack was full of warm clothes for him to put on afterwards, a big bottle of post run chocolate milk we’d picked up in the Monoprix back by Gare du Nord and his phone. “Meet me in an hour by the café,” Commando said as he set off. Simple, I thought, remembering the raised area of paving where we’d watched the little boy running off with the football the morning before. As he disappeared into the distance I stood looking down one of the avenues of trees towards the chateau wondering where to start. 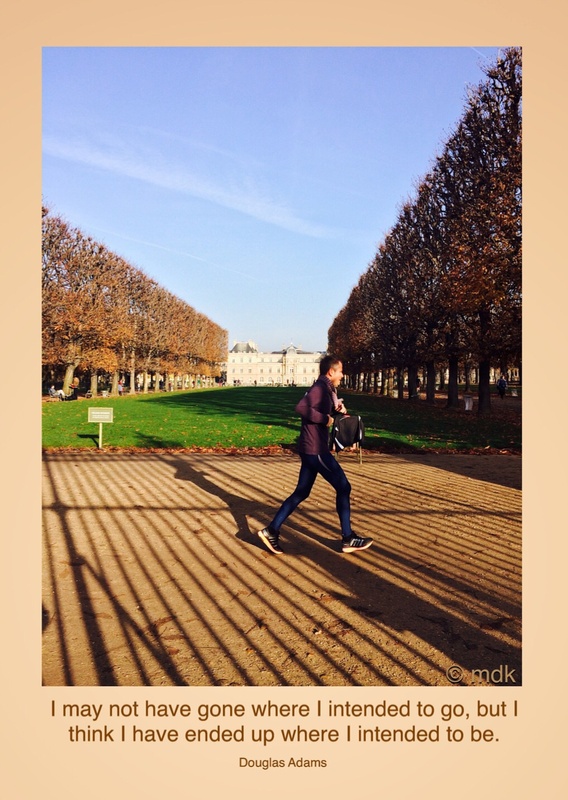 The ground, striated with long shadows from the low sun, was littered with autumn leaves and people were running or strolling everywhere enjoying the surprisingly warm day. Maybe the best thing would be to find the café first and get my bearings. Memory told me we’d been looking out over the formal gardens, created by Jacques Boyceau de la Barauderie in 1630 so that seemed the sensible way to go. These were an addition to the original gardens, laid out in a series of squares with borders, hedges and, in the centre, an octagonal pool used these days for remote control boats. 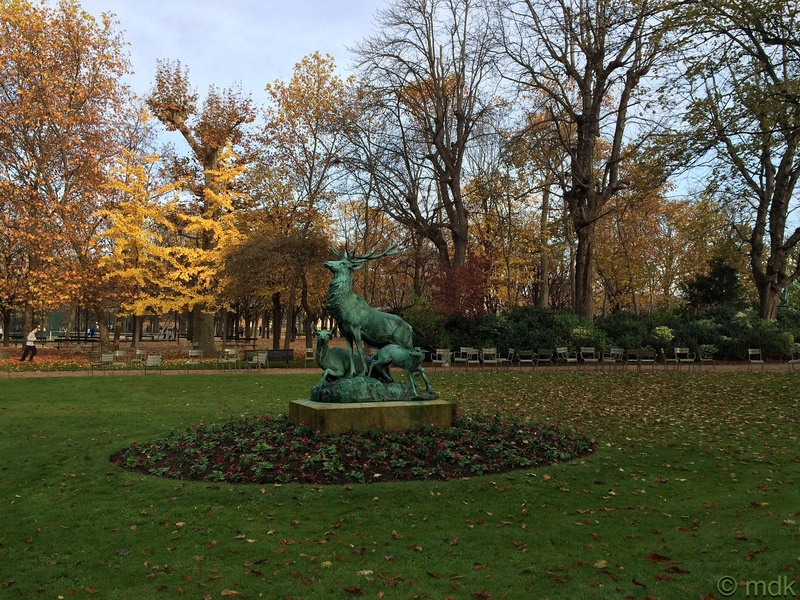 Jacques also worked on the Tuileries Gardens and those at Versailles, both of which I’ve seen on previous visits. 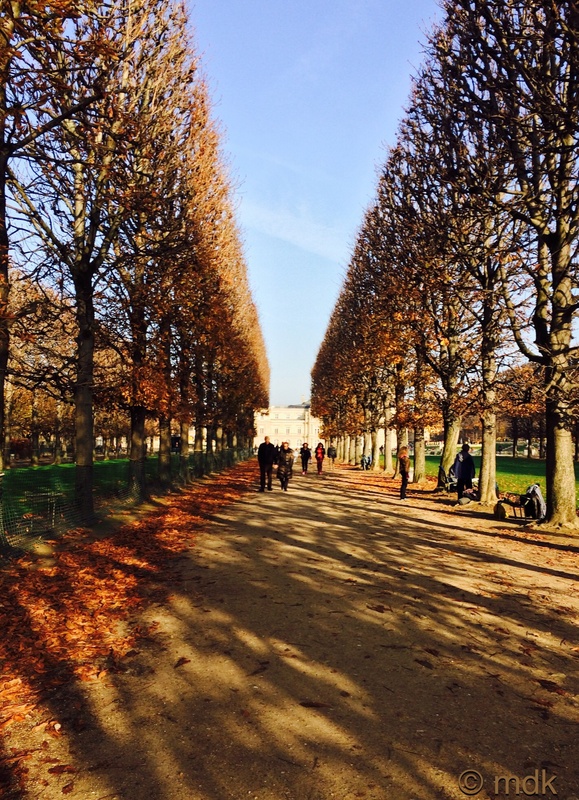 Strolling towards the chateau in the sun all seemed well with the world. There was plenty of time and I stopped to snap the building and the people chatting on some of the little green chairs that are scattered around the park. By the pool I stopped again to take a picture of a mother holding a small boy who was enthralled by the little boats. The reflection of the chateau shimmered on the water. This chateau was the hotel du Luxembourg until, in 1611, Marie de’ Medici, the widow of Henry IV, purchased it and commissioned Salomon de Brosse to turn it into a place imitating the Pitti Palace in her native Florence. 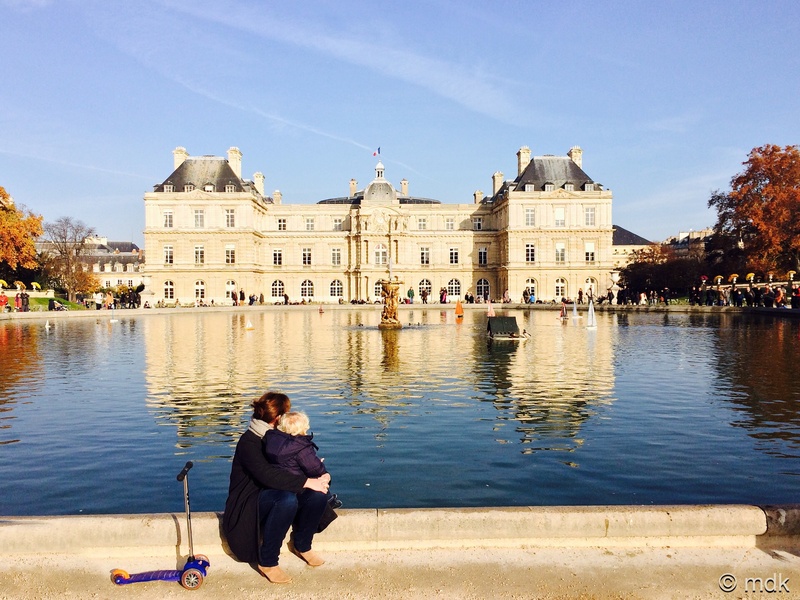 She called it the Petit-Luxembourg palace. 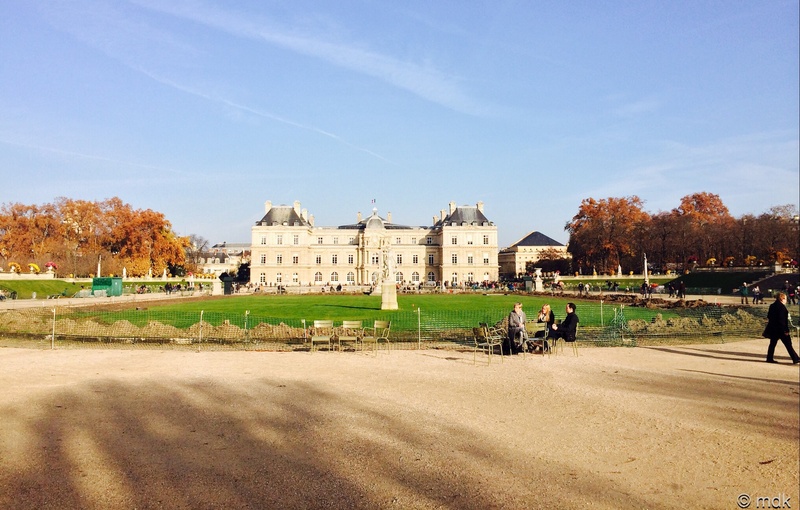 These days the garden and the palace are owned by the French Senate. Turning in what I thought was the right direction I stopped again to take a photo of a group practicing Tai Chi under a marble statue of Valentina Visconti, Duchess of Orléans, by Jean Pierre Victor Huguenin. A large gate to my right seemed to be locked so I turned left and found Aimé-Jules Dalou’s beautiful monument to romantic artist Eugène Delacroix who is buried in Père Lachaise Cemetery. Still thinking I had plenty of time I dallied for a while admiring the details of the bronze sculpture. Not long after I set off again I saw Commando zipping past. Shortly after this I discovered the path I was on led out of the park or back in the direction I’d come. This was a bit worrying but I was sure WalkJogRun would soon set me straight, after all, how hard could it be to spot a large paved area in a park, even one that covers fifty seven acres? Very hard it turns out. As far as I could see there was only one paved area and it was surrounded by trees nowhere near the lake or the formal gardens. A little knot of panic started in the pit of my stomach. The best course of action seemed to be to go in the direction Commando had and hope I would either stumble upon the café or see him again. At this point I still had over forty minutes before my rendezvous so I quelled my fears and kept going only now I wasn’t strolling, I was walking fast. 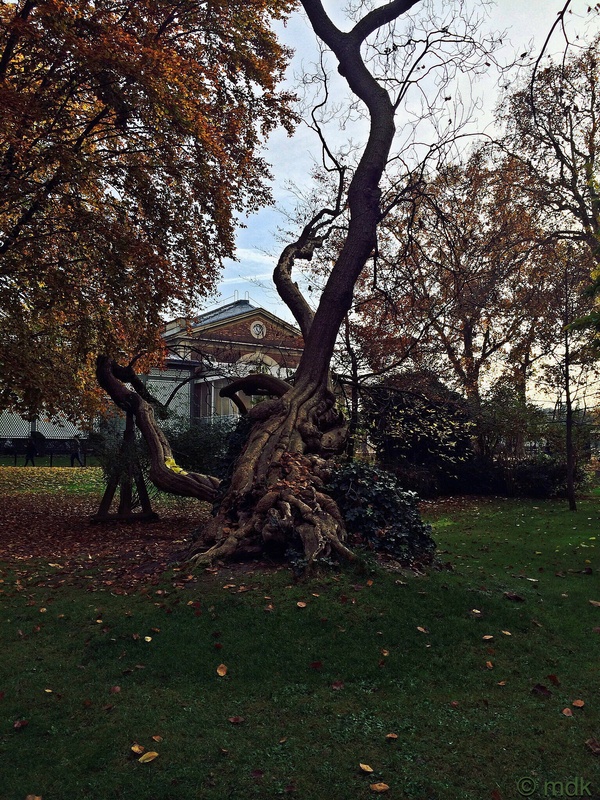 One fallen tree with a curiously gnarled and twisted trunk did make me stop long enough to take a photo. On any other day I’d have gone for a closer look. A little further on I paused again when I saw a very familiar statue. 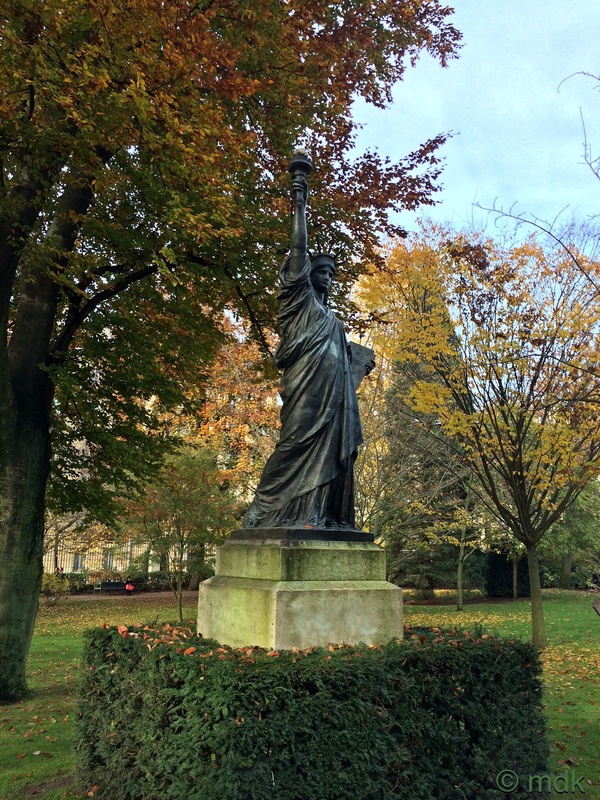 In Paris there are three replicas of the Statue of Liberty, all the work of Frédéric Auguste Bartholdi the sculptor who designed the original. 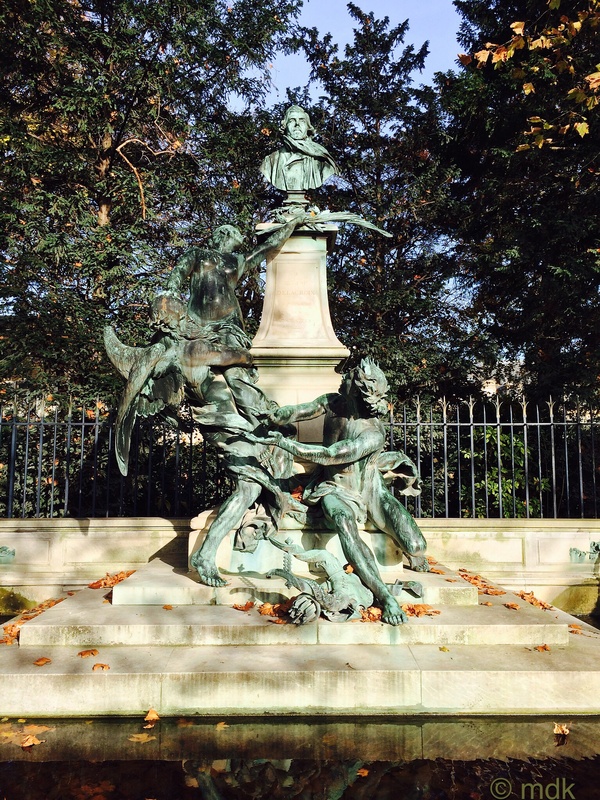 This particular replica was presented at the 1900 World Expo and donated to the Musée du Luxembourg by Bartholdi. 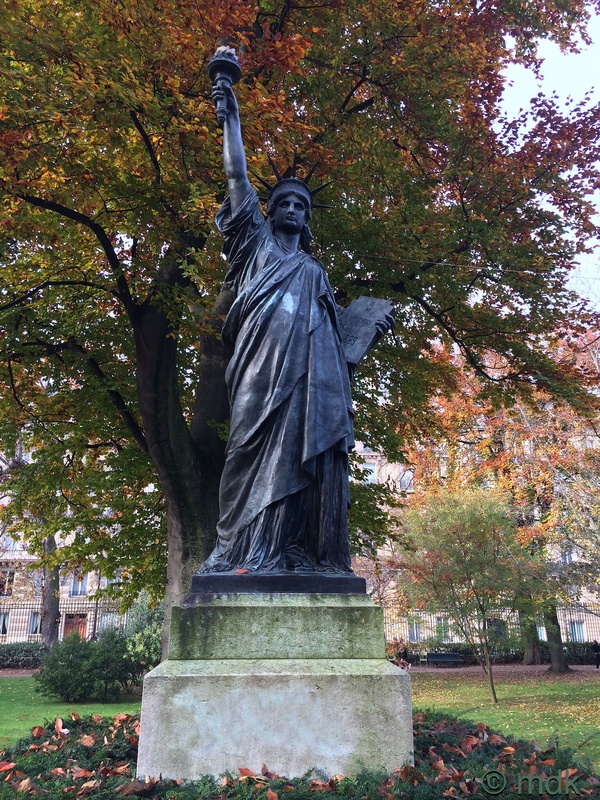 At the request of Madame Bartholdi it was erected in the gardens in 1905. Not long after this I began to doubt my memory. Had the cafe actually been in the park or had it been in one of the small parks on the other side of the gates where we came in? There was only half an hour left now so I hurried along, stopping very briefly for a snap of the bronze herd of stags by Arthur Jacques LeDuc. Now there was no holding back the panic, I half ran through the gates and the other parks, then turned and half ran back when there was no café. Inside the gates again I sat on one of the green chairs and looked at WalkJogRun again but ended up more confused if anything. It was as if the cafe and the terrace had disappeared altogether. In desperation I dashed back along the avenue of trees to the lake, past the Eugène Delacroix monument and through the gate, looking wildly up and down the road as if somehow the cafe would miraculously materialise. Back by the lake I stood trying to work out where I’d gone wrong but there were trees in every direction and I knew we’d been sitting on a paved terrace. Once again I hurried back to the beginning. By now there was no plan and the hour was already up. A little part of me was hoping Commando would have realised I was lost and gone back to the place he last saw me too. Once again I sat on the green chair trying to will Commando to appear. As I said at the start, getting lost isn’t normally too much of a worry and it wasn’t really the being lost that was bothering me. After all I had money in my rucksack and my metro ticket, I knew where the metro was and I could even have walked back to the hotel if I’d wanted to. The big problem was that Commando was somewhere in the park waiting for me, probably pretty cross, and he had no money, no metro tickets, no phone, no warm clothes or chocolate milk. If I didn’t find him he was going to have to walk or run back to the hotel and he was not going to be happy at all if that happened. As I sat there, close to tears, I started to wonder how it had all gone so wrong. When Commando had set off for his run I thought I knew where the café was, I’d even been thinking about getting a coffee when I got there. Then I wondered if the problem was the direction I took along the avenue of trees. Commando had set off along the right side of the park, maybe if I did the same I’d find him or the cafe. Part of me thought I was grasping at straws but what else could I do? Down the right side of the park I went, sticking to the perimeter. Ignoring the pool and the formal gardens I kept going across a paved area dotted with trees then, all of a sudden, there was the cafe in front of me. The raised area of paving was actually planted with trees I’d either never noticed or forgotten about, effectively hiding it on the satellite map. By this time it was half an hour after I was supposed to meet Commando. My heart sank when I couldn’t see him and I walked towards the café with tears running down my face. He’d obviously got fed up with waiting and… what? Gone in search of me in the park? Gone back to the gate where we’d parted? Run back to the hotel? What should I do now? You mention that ordinarily you don’t mind getting lost. That brought to mind Venice, Italy, another place where a rendez-vous is bound to happen sooner or later. It all sounds very frightening, poor you. It was. I can’t believe I couldn’t find the café. I got lost in the woods just once and I’ve never forgotten how that felt. I don’t know much French but I’m not sure “petit” is the word I’d use to describe that place. Getting lost in the woods is quite frightening because you can so easily end up walking in circles without realising it and, amongst the trees, it hard to get a sense of direction. Usually I have the sat nav on my phone to get me out of trouble and back to the world though. This was different, it was more about losing Commando than losing myself. The palace is huge but I guess it was smaller than the original. Sounds like that would have been scary. I too have an affinity for getting lost, having a horrible sense of direction. So I try not to wander off very often. I have had a couple long adventures traipsing through the woods with no clue where I was. Well, I assume everything worked out for you. I can see myself getting into that type of situation, and I know it would not be fun–even in France. Great post Marie! It’s funny how easy it is to get disoriented, even in a park. Usually when I get lost it’s just a wrong turn or following a footpath I think will lead somewhere that turns out to take me somewhere different. The woods are the worst place to get lost though because it’s easy to end up walking in circles. There’s one part of the New Forest I’ve done that in quite a few times. I once got lost in Central Park. Who knew you could get lost in a PARK in the city. I was never so happy to see traffic in my life when I finally made my way out. And my first evening in Rome I got mixed up and it was getting dark. I think Rome was worse because of the language barrier. You are a sweetheart for being so upset because Commando would be without supplies. Very sweet! Luckily I speak French so at least that was one thing. Uh oh. Glad you found the cafe in the end. But did you fine Commando…?